Rhinegeist brewery and the Northside Yacht Club have come together to create a new brew to the delight of local beer lovers. Dinghy, described as “a sophisticated, complex, pale ale,” is the brew-child of Jon Weiner, co-owner of the Northside Yacht Club, and Bryant Goulding, co-owner of Rhinegeist. Its alcohol-by-volume content is 5.4 percent and it features three different kinds of hops, Idaho 7, Mosaic, and Simcoe, that create “piney, resiny, red grapefruit and tropical” flavors, according to Rhinegeist’s description. 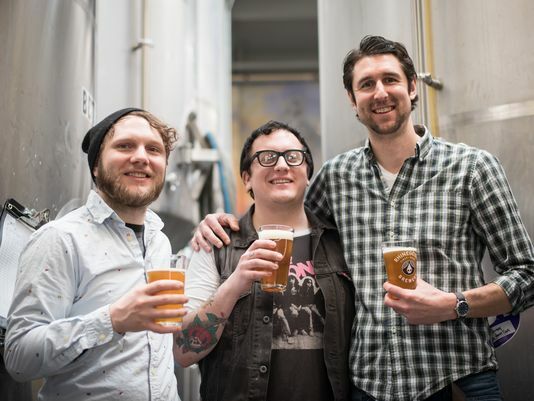 Goulding took Weiner on the first tour of Rhinegeist brewery, where Weiner tried the first batch of Truth India Pale Ale from the tank, according to Stuart MacKenzie, co-owner of the Northside Yacht Club. The two became friends and remained in contact as the Northside Yacht Club prepared to open in August. “Bryant realized just how much the two businesses had in common — both were teams of young dreamers and entrepreneurs trying to make something out of nothing — salvaging old buildings and transforming them into new, vibrant, bustling, businesses, in great Cincinnati neighborhoods, just off the beaten path,” MacKenzie’s said. Goulding used a family recipe to create the Dinghy recipe with Weiner. They dry-hopped the first keg of the new brew to be served at its all-day launch party.